Born in Stamford, England, Colin Furze is quite a prominent name in the YouTube world. Known for his ingenious, yet utterly mind-boggling inventions, the Gadget Geeks-star is credited for building the world’s longest scooter as well as the world’s fastest stroller. 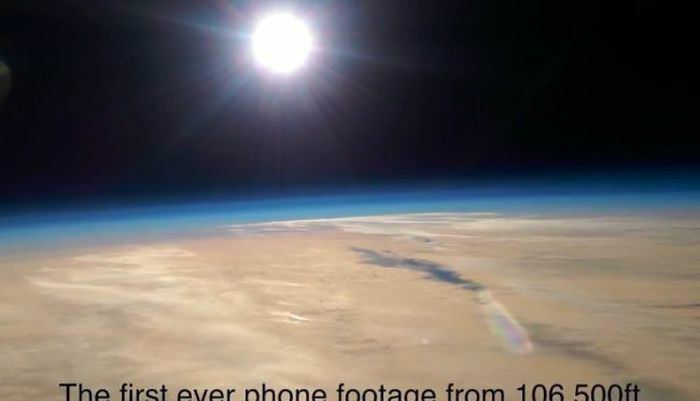 Well this time around, Furze has successfully managed to capture the first ever space video from the stratosphere, that too with the help of a smartphone! Stratosphere, as might already know, is the second layer of the Earth’s atmosphere, situated above the troposphere. For his latest project, Furze used HTC One M8s camera phones, that were then placed inside temperature-resistant boxes. Bits and pieces of polystyrene and duct tape were attached to provide greater strength and protection. Finally, the setup was sent into the atmosphere by means of 12 space balloons. Given to elaborately flamboyant displays, Furze included an incredible fireworks show at an altitude of 20,000 feet above the clouds. Captured at an astounding height of 106,000 feet, the video footage is the first of its kind to be recorded by means of a smartphone. Upon reaching a total altitude of about 106,500 feet above the Earth’s surface, the balloons burst, causing the phones to come crashing down to the ground. Despite falling through such a height, the phones have survived without any damage.